Place your phone where you can get good reception. To use the system, the Bluetooth On/Off Status setting must be On. If there is an active connection to Apple CarPlay, HFL is unavailable. Aim the vents away from the ceiling and close the windows, as noise coming from them may interfere with the microphone. Press the button when you want to call a number using a stored voice tag. Speak clearly and naturally after a beep. If the microphone picks up voices other than yours, the command may be misinterpreted. To change the volume level, select the audio system's VOL (Volume) or use the remote audio controls on the steering wheel. Up to five speed dial entries can be displayed among a total of 20 that can be entered. Up to five previous calls can be displayed at a time among a total of 20 that can be entered. If there is no call history, Call History is disabled. (Pick-up) button: Press to go directly to the phone menu on the driver information interface, or to answer an incoming call. (Hang-up/back) button: Press to end a call, go back to the previous command, or cancel a command. (Talk) button: Press to access Voice Portal. 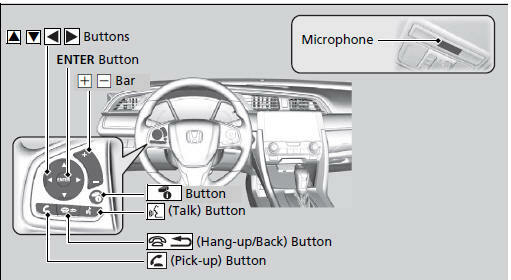 buttons: Press to select an item displayed on the phone menu in the driver information interface. ENTER button: Press to call a number listed in the selected item on the phone menu in the driver information interface. button: Select and press ENTER to display Speed Dial, Call History, or Phonebook on the phone menu in the driver information interface. Select Phone to switch the display to the phone screen. Bluetooth Wireless Technology The Bluetooth word mark and logos are registered trademarks owned by Bluetooth SIG, Inc., and any use of such marks by Honda Motor Co., Ltd., is under license. Other trademarks and trade names are those of their respective owners. HFL Limitations An incoming call on HFL will interrupt the audio system when it is playing. It will resume when the call is ended.